Six months after Thor: Ragnarok hit theaters, filmmaker Taika Waititi is rolling cameras on his next project. Instead of jumping to a Star Wars movie or another major comic book adaptation after the What We Do in the Shadows filmmaker’s Marvel debut, Waititi instead has opted to throw his weight behind an anti-war satire with a phenomenal cast. The film is called Jojo Rabbit and it tells the story of a young boy living in World War II Germany whose only ally is his imaginary friend Hitler, played by Waititi. His naïve patriotism is tested when a young girl upends his worldviews and forces him to face his biggest fears. Waititi wrote the original screenplay, and production is underway on the Fox Searchlight film in and around Prague, Czech Republic. Newcomer Roman Griffin Davis plays the boy, but the incredible ensemble includes Scarlett Johansson, Sam Rockwell, Rebel Wilson, and Leave No Trace breakout Thomasin McKenzie. Waititi, Carthew Neal (Hunt for the Wilderpeople) and Chelsea Winstanley (What We Do in the Shadows) are producing with Kevan Van Thompson (The Zookeeper’s Wife) serving as executive producer. 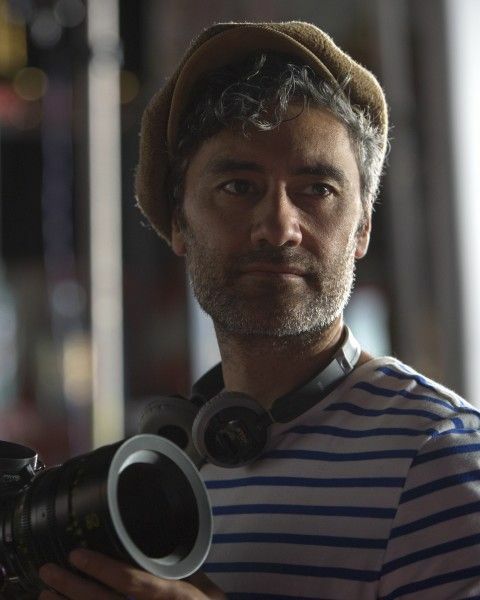 As if things couldn’t get any more exciting, Waititi will be working with The Master cinematographer Mihai Malaimare Jr., as well as production designer Ra Vincent (Thor: Ragnarok), editor Tom Eagles (Hunt for the Wilderpeople), costume designer Mayes Rubeo (Thor: Ragnarok), and make-up and hair designer Dannelle Satherley (Hunt for the Wilderpeople). Fox Searchlight is coming off Best Picture and Best Director Oscar wins for Guillermo del Toro’s The Shape of Water, and Jojo Rabbit marks a wildly exciting addition to their slate. As for Waititi, he’s also attached to direct a new adaptation of Akira for Warner Bros. No release date for Jojo Rabbit is set just yet, but expect this one either late this year, or sometime next year.